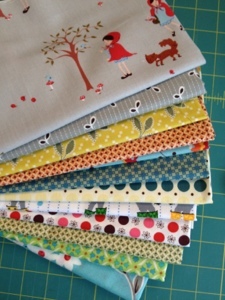 I do love happy mail, and last week I got a great package of it from my friend Brenda at Pink Castle Fabrics. I really don't need any fabric, and seriously have enough to last me quite a while, but I couldn't help add to my stash during her big sale. Brenda has lots (I mean, like over 200) fabrics on sale for $5 a yard. Kind of crazy, right? And at those prices, I just couldn't resist. As you see, I bought some Flea Market Fancy, some Hope Valley, a fun Aneela Hoey print, and a really fun Laurie Wisbrun print. I don't have any big plans for any of them right now, so for the time being they'll sit on my shelf with some friends. The sale at Pink Castle Fabrics runs through tomorrow, Sunday, August 19. There are still lots of goodies, so go ahead and help yourself too! And thank you to all who have already donated to the Action Kivu fundraiser! Alissa is well on her way to her goal, but she still needs help, so please give what you can. Thank you, again! I did the same thing - I don't really need any new fabric, but how could I resist such great fabrics at great prices!